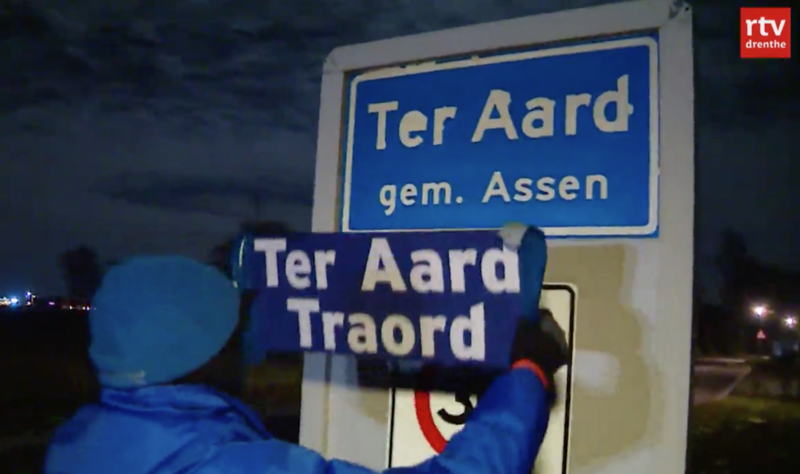 In an effort to encourage continued use of Drents dialects, the GroenLinks faction in the municipality of Tynaarlo wants town signs to be displayed in Dutch and Drents. RTV Drenthe reports that the party starting campaigning for the signs after a local action group named Drents op Stee made 12 bilingual signs in the province in February. The group posted signs in a dozen Drenthe towns (in Dutch and Drents): Ter Aard (Traord), Hooghalen (Haolen), Roden (Roon), Geeuwenbrug (De Gowe), Meppel (Möppelt), Ruinen (Rune), Stuifzand (Stoefzaand), Oosterhesselen (Hesseln), Nieuw-Dordrecht (Nei-Dordt), Nieuw-Buinen (Bunermond), Rolde (Raol), and Zuidlaren (Zuudlaoren). Drents op Stee has been carrying out similar sign-changing projects since at least 2014. GroenLinks currently provides Drents children’s books to primary schools across the municipality, and Tynaarlo will cover the 115 euros in costs connected to that project. GroenLinks also wants the council to look into making all town signs bilingual in the province. Drents is actually a collection of seven dialects within the province, and the members of the council jokingly debated whether the Veenkoloniaals or Noordenvelds variant sounded nicer. Anneke Lubber of the Labour Party faction suggested that if the municipality were to follow the Frisian example of posting town names in Dutch and the local language, it could come across as uninviting to visitors.